Speaking is a crucial part of second language learning and teaching. 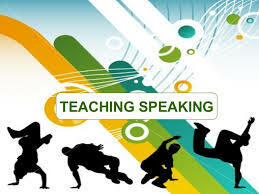 Despite its importance, for many years, teaching speaking has been undervalued and English language teachers have continued to teach speaking just as a repetition of drills or memorization of dialogues. However, today's world requires that the goal of teaching speaking should improve students' communicative skills, because, only in that way, students can express themselves and learn how to follow the social and cultural rules appropriate in each communicative circumstance. a. Produce the English speech sounds and sounds patterns. c. Select appropriate words and sentences according to the proper social setting, audience, situation and subject matter. d. Organize their thoughts in a meaningful and logical sequence. e. Use language as a means of expressing values and judgments. Belum ada tanggapan untuk "Teaching of Speaking"